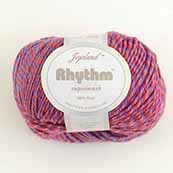 Jojoland's Rhythm Superwash has a wide array of fun colors that slowly change as you knit along. Each of its four plies is variegated separately. Plying them together creates a yarn with very slow color gradation rather than abrupt stripes. Rhythm Superwash is great for so many different projects--hats, boot socks, sweaters, shawls--and has the bonus of being machine washable.